Since 1994, Munie Leisure Center has been bringing St. Louis Metro East families closer together one backyard at a time. We are your pool & spa store. Munie Leisure Center is a full-service swimming pool and hot tub dealer in St Louis Metro East. We are specialists in inground pools, above ground pools, hot tubs, spas, jacuzzi and outdoor fun. Collectively, our team of experts has more than 180 years of experience in the pool and spa industry. Our high standards, creativity and commitment to customer service have garnered recognition by the Association of Pool and Spa Professionals for outstanding pool design and installation and from Pacific Pools with its Showcase Award of Excellence. Take a look at some of our award-winning work to get an idea of how we can transform your yard.You can trust Munie's experienced pool and spa builders to build your inground pool. 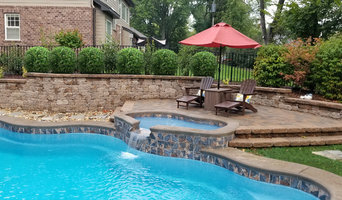 Whether your dream involves a new pool or hot tub or a remodel of an existing one, you can trust our experts to design, build and landscape your oasis. We are your pool & spa store. Stop by, call or email and let us offer you our award-winning service. Custom Pool LLC is the leading designer and builder of quality in-ground pools and backyard landscapes. With more than 20 years of experience, we have the knowledge, and will translate your visions into reality. Our expert staff will walk you through the steps it takes to complete these visions. Build/design custom inground pools, spa, and outdoor kitchens.